Bourbon balls tend to be a Christmas candy. They are so good; I don’t think that anyone will object to these tasty truffles. They are pretty easy to make. Definitely a recipe to add to my repertoire. Bring heavy whipping cream to a boil. Remove from heat. Add chocolate; stir until smooth. Add bourbon; stir until well-incorporated. Add salt. Let the chocolate mixture rest at room temperature until firm. (I put mine in the fridge for about an hour). Using two spoons, portion out balls of ganache, about the size of a walnut. Hand roll balls until smooth and then roll it in the pecans. Makes about 40 truffles. 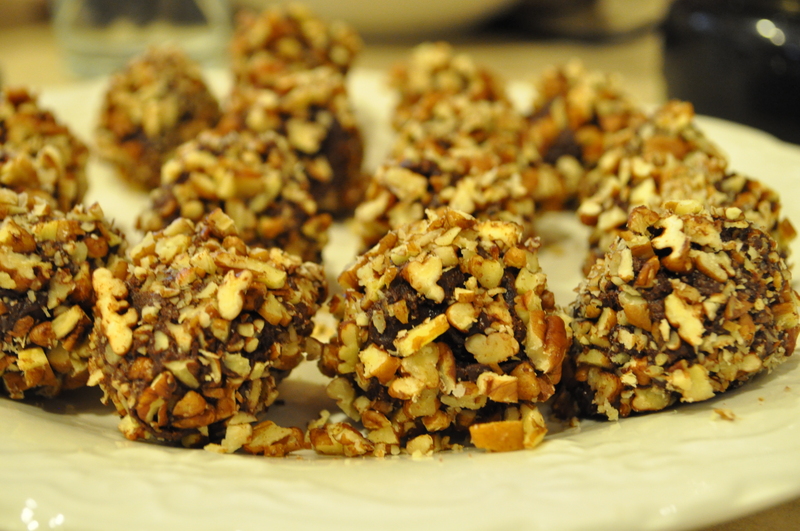 I love bourbon balls…one of my favorite christmas cookies. I know I will love your truffles.